RALEIGH, N.C. -- IMPATHIQ, empowering hospitals to improve health outcomes for patients experiencing chest pain while significantly reducing costs, is pleased to announce the American Heart Association journal Circulation has recently featured the company’s Heart Pathway point-of-care clinical decision support tool. 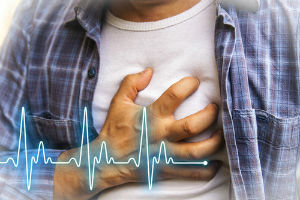 The article “Safely Identifying Emergency Department Patients with Acute Chest Pain for Early Discharge: The HEART Pathway Accelerated Diagnostic Protocol” appeared September 28th in Circulation, which publishes original research manuscripts, review articles, and other content related to cardiovascular health and disease. “With Heart Pathway having gone through the rigors of evidence-based medicine, we’re thrilled by the opportunity to share substantive data on our tool to help guide evidence-based healthcare and standardize it across an entire system,” said IMPATHIQ Co-Founder and CEO Iltifat Husain, MD. This summer, Heart Pathway was successfully installed across the Boston-area Cambridge Health Alliance to streamline chest pain care in its emergency departments, which serve about 100,000 patients a year, strengthening patient care while reducing the number of low-risk chest pain admissions. The Circulation article focused on results from a three-year clinical study of 8,474 adult emergency department patients. The study examined the safety and effectiveness of IMPATHIQ’s groundbreaking health informatics technology as a means of providing point-of-care clinical decision support for patients presenting chest pain. As reported in Circulation, the implementation of Heart Pathway was associated with decreased hospitalizations, increased identification of index visit myocardial infarctions, and a very low death and myocardial infarction rate among low-risk patients. Dr. Mahler explained that a key takeaway from this study for physicians is that the Heart Pathway is safe and effective at identifying emergency department patients for early discharge without stress testing or coronary CT angiography. Emergency department physicians should use an ADP, such as the Heart Pathway, to guide their testing and disposition decisions, he said. Heart Pathway is available on Cerner, Epic, and other EHR platforms and can be easily installed by health systems in a fashion similar to installing an app on a smartphone. Heart Pathway asks healthcare providers a series of objective questions about patient symptoms, risk factors and EKG findings. The tool then produces a risk score and recommendation, documenting results directly into the EHR while providing administrators access to valuable statistics to help standardize care across an entire system. “Heart Pathway is the only tool available on the EPIC App Orchard store for patients presenting to the ER with chest pain,” Dr. Husain said. IMPATHIQ is continuing to share information and data on Heart Pathway with the medical community. Dr. Husain will be presenting “Transforming Validated Clinical Research into a Cerner and EPIC FHIR Application” at the NCHICA 24th Annual Conference in Charlotte, N.C. this month. He was interviewed about this upcoming presentation by Janet Kennedy of Get Social Health for a NCHICA Healthcare IT Trends podcast available online at https://nchica.org/nchica-annual-conference-podcast-series-featuring-iltifat-husain/. Dr. Husain will also be presenting at the EPIC App Orchard Conference in Verona, Wisconsin later this month. He will be sharing data from IMPATHIQ's successful Heart Pathway implementations focusing on how the FHIR standard enables tracking clinician and nursing adherence to best practices in real time. A peer-reviewed weekly journal with an 8% manuscript acceptance rate, Circulation publishes observational studies, clinical trials, epidemiology, health services and outcomes studies, and advances in basic and translational research. The journal's readership of 22,441 includes cardiologists, cardiovascular surgeons, electrophysiologists, interventionalists, internists, nurses and others interested in cardiovascular medicine. Heart Pathway is powered by IMPATHIQ’s scalable, customizable IQ Engine data platform which provides smart clinical decision support for doctors and their patients with real-time analytics and feedback. Heart Pathway takes less than 20 hours to implement and can all be done remotely. For more information, visit www.impathiq.com or email info@impathiq.com. IMPATHIQ is a groundbreaking human informatics company empowering hospitals to improve health outcomes for patients experiencing chest pain while significantly reducing costs. Our scalable, customizable IQ Engine data platform provides smart clinical decision support for doctors and their patients with real-time analytics and feedback, while our revolutionary Heart Pathway quickly and accurately identifies cardiac events to speed-up patient access to care and free-up emergency rooms. Implementation is unusually fast for hospital systems and medical staff, providing easy accessibility to EHR data like never before. To learn more visit www.impathiq.com.